“How could anyone make a 90-minute long movie just about someone getting lost in space?” was the first thing that would come out of the mouths of my friends whenever Alfonso Cuarón’s latest film, Gravity, would be brought up. And I must confess I found myself asking the same question. I did this in spite of my belief that a good movie can be made out of anything with a proper vision and within the appropriate hands. Adding to my folly was the fact that I did enjoy the trailers I’d seen for the film. They were intense yet vague enough to pique my curiosity. And they did their jobs—they got us talking about the movie. My incredulity was tamed by the high praise of James Cameron, who called Gravity “the best space film ever done” (whatever that vague praise means, it’s definitely high praise). Upon watching the movie, the answer to the aforementioned question is simple: Cuarón did not make a movie just about someone getting lost in space. He made the movie about getting lost in space, and it was so much more than just that. 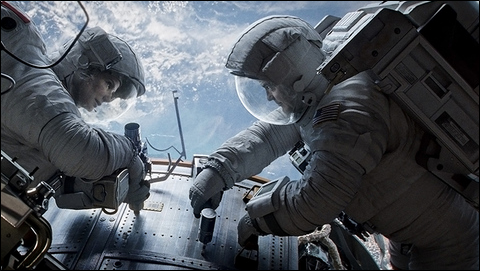 The film stars Sandra Bullock as Dr. Ryan Stone, a medical engineer who has embarked on her first mission into space. Her natural inhibitions in the situation don’t combine well with hang ups she has over the abrupt death of her daughter years ago. Accompanying her is George Clooney’s Lieutenant Matt Kowalski—foil to Stone in his experience, composure, and levity despite the dangerous situations in which the duo finds themselves. And find danger they do. After an immaculate uninterrupted opening shot accompanied by no score, the plot is kick started when debris from a satellite destroys their shuttle and sends the astronauts hurling into space. The next hour and a half’s dedicated to their attempts to survive whilst overcoming any obstacles that endanger them—including themselves. As previously mentioned, the film opens with the build of a loud whine, and then silence, accompanied by the opening shot which is held uncut for several minutes as the camera pans around the shuttle, introducing us to our protagonists. The long shots utilized, plus close in, claustrophobic shots in the film draw you into the action, adding a layer of verisimilitude already present in abundance due to the masterful sound editing and usage of the score (or lack thereof). There’s nothing quite like it when you witness an astronaut spiraling through space as machines explode around her and yet nothing is audible sans her panicked gasps and cries for help. When the characters are struggling to breathe, or fighting to hold on, you’ll find yourself catching your own breath, and gripping the seat of your chair for dear life. It’s a wholly engrossing experience further enhanced by contrasting shots of the gorgeous planet Earth and the cold, condemning depths of space. The setting notwithstanding, Gravity manages to avoid being a sterile experience for the viewer. You will sympathize with the struggles of Bullock’s Ryan further than simply her fight for survival in space, as she subtly (in that it doesn’t take from the film’s focus) goes through a metamorphosis of sorts throughout the movie. The film has deeper themes of the inevitability of death and spirituality, and metaphysical shots of un-birth and evolution. This plus the astounding soundtrack by Steven Price enhance the experience even further. And that’s what Gravity is. It’s a true space experience—a marvel of contemporary film technology and technique that will have you glued to the screen and on the edge of your seat from the beginning until your departure, astounded by what’s been seen and longing for more.